This guided Landmannalaugar tour will take you to this extraordinary nature reserve. Hike in this surreal landscape in between colorful mountains in the unique highlands of Iceland. Book this guided Landmannalaugar tour and experience the extraordinary nature with your own eyes! On the way to Landmannalaugar you’ll drive through the beautiful Þjórsárdalur Valley. Þjórsárdalur valley is an old caldera that has been extensively modified by glacial erosion and is now traversed by river Þjórsá, the longest river in Iceland. Due to its vicinity to volcanoes, such as Hekla, Grímsnes and Vatnaöldur volcanic systems, the valley is covered by pumice. Hjálparfoss is a beautiful waterfall, split into two separate falls that join at the base and into a small lagoon. The waterfall is surrounded by beautiful basalt columns and formations. Háifoss waterfall is the third highest in Iceland, after Glymur and an inaccessible waterfall in Morsárjökull glacier. Your first stop in the highlands of Iceland will be at Ljótipollur lake. Ljótipollur is an explosion crater, formed in an eruption in 1477. Explosion in eruptions, like Ljótipollur, are caused by unusual amount of water vapor, from the groundwater, in the magma. The eruption leaves a hole in the ground, a crater. The craters are often filled with water, because they extend farther down in the ground than the surface of the groundwater. Landmannalaugar are next up! Landmannalaugar and the surrounding nature reserve is one of the most beautiful geological landscapes of Iceland, and beyond. The landscape resembles an adventure or a painting with beautifully colored bright green, yellow and pink rhiolithic mountains with patches of black shiny obsidian. Landmannalaugar is often the starting point of the well known Laugavegur, a few days hiking trail to Þórsmörk nature reserve. When you have taken in all the beauty of the area your guide will take you back to Reykjavík. You can expect to arrive in Reykjavík in the evening. 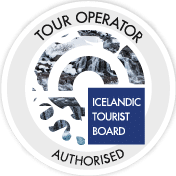 This tour is operated by our friends at travelling Iceland. They put an emphasis on environmental protection and nature conservation. They take a part of their income and give it towards environmental incentives.